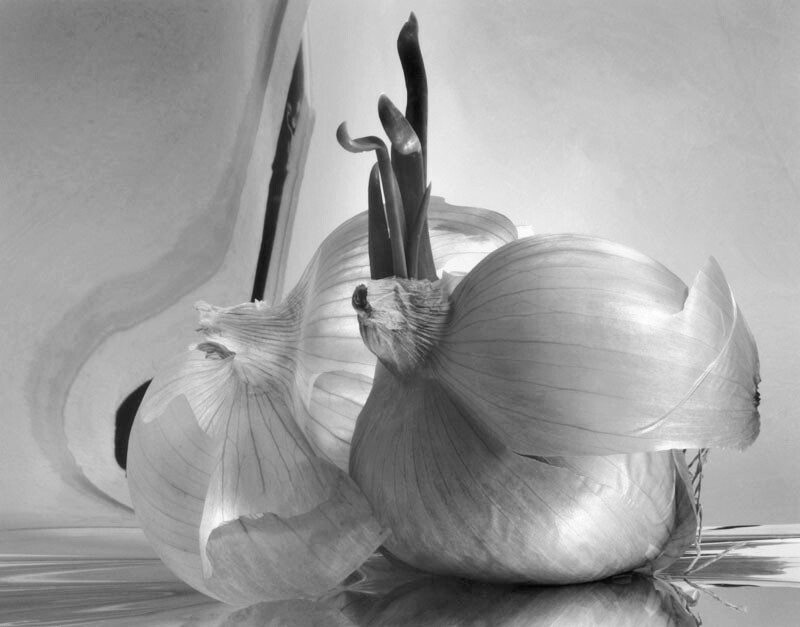 My Onion image probably generates more questions and comments than any other image I've ever made. Here's its story. I originally bought this onion to cook with. As fate would have it, I went out of town unexpectedly before I had a chance to use it. When I returned home, the onion had started to sprout in an interesting way, so I decided to let it "do its thing." A week or two passed, and the onion continued to sprout. One night as I was getting ready for bed, I saw the onion sitting on my kitchen counter. It said "now," so I went and got my 4x5 camera out. I had some mirrored mylar left from my studio days in San Francisco and decided that would make a fun background. As I started fiddling with my "model," some of the skin fell off, but it gave my scene a lovely sense of luminosity, so I decided to keep it in the image. The only light was the ceiling fixture in my kitchen. By the time I calculated the basic exposure and all the other necessary adjustments, I wound up with a 40-minute exposure. I opened the shutter, tip-toed out of the house and went for a 40-minute walk. I came back at the after the 40 minutes were up, closed the shutter and called it a night. Because everyone asks...the shape to the left of the actual onion is not its reflection on the mylar, but rather the profile of my kitchen counter and cabinet. It's just a coincidence that it mimics the shape of the onion so closely. And if you look carefully, you can see the reflection of my kitchen light on the onion's skin.